If you have ever been in Berlin before, you probably also visited Alexanderplatz. This pleasant square in the middle of the city is one of the most popular sights in Berlin. During the tourist-season more than 300.000 people visit “Alex” everyday. The central square in the heart of Berlin was brought to life in the early 19th century. The former Trade Square Ochsenplatz was renamed by the Russian Tsar Alexander the first (1777-1825). Over the years, the square had several different purposes: First, for quite a long time, the square was known as a cattle-market where people came together to do business. Later, during the Second World War, Alexanderplatz was used for its underground bunkers and unfortunately this also meant that it was one of the main targets for the enemies of Adolf Hitler. Nowadays it is the main traffic point and one of the most famous touristic attractions in Berlin. The transformation into a modern transport-station began with the construction of the rail-network in 1882. 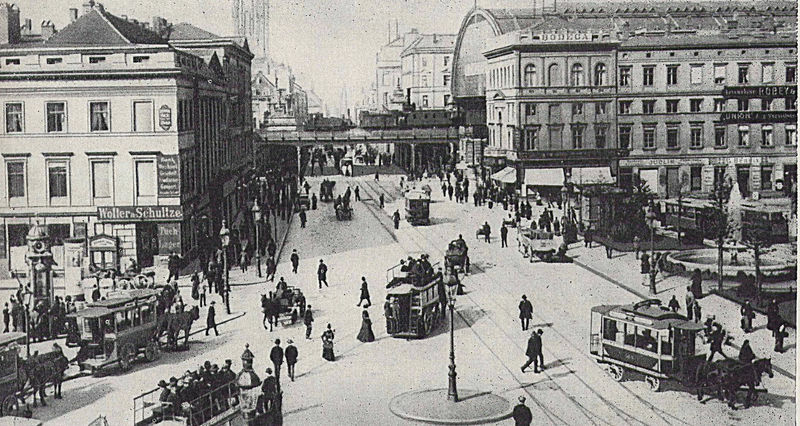 Later, in 1913, the underground section was added and Alexanderplatz became more and more important for the traffic in Berlin. 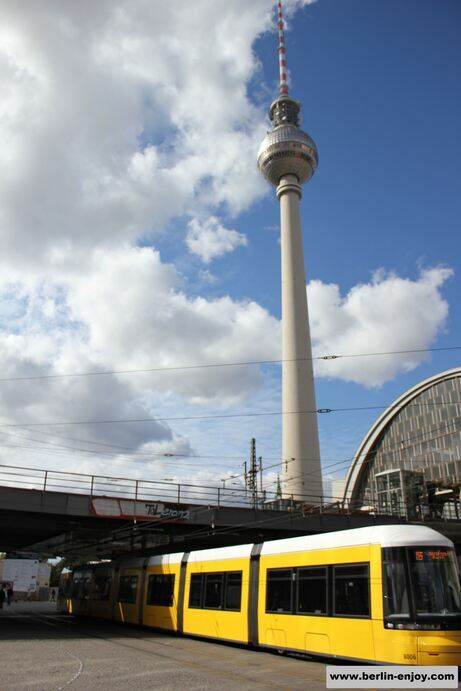 As we speak more than half a million people are travelling through Alexanderplatz every single day! The central location has always ensured that Alexanderplatz was used as the most important landmark of Berlin. This honor is largely due to the Fernsehturm (or TV-Tower) which is located directly next to Alexanderplatz. The TV-Tower can be seen from almost any position in Berlin and therefore it is a great meeting-point and way to recognize where you are currently located. Besides being easy to find Alexanderplatz is also a great meeting-point because it is so easy to reach other attractions in Berlin. 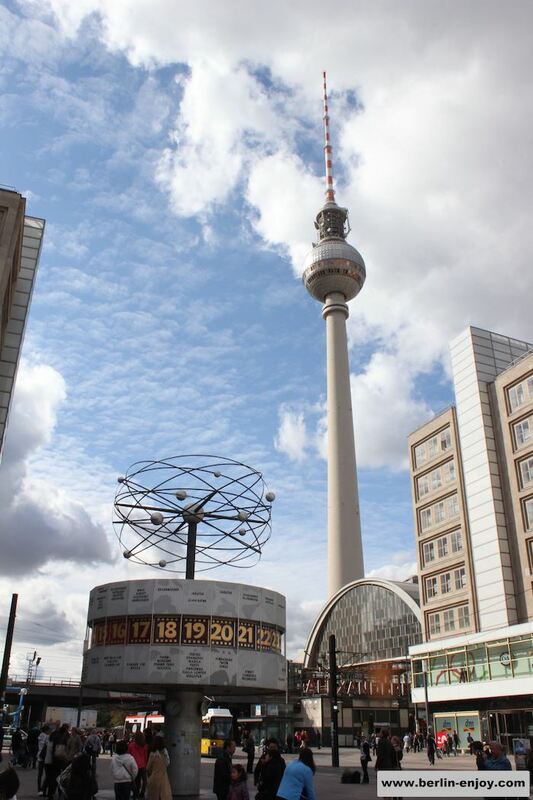 One of the major attractions for the visitors of Alexanderplatz is the Fersehturm. As discussed, the Fernsehturm is especially popular because it can be seen from almost every location in Berlin. The tower is 368 meters long and the great thing is that you enter the visitors platform at 204 meter. The view is spectacular and you can even have lunch or dinner at the top as well. The price for visiting the visitor platform is 12.50€ and you also have to pay this if you want to have dinner. Another interesting attraction on Alexanderplatz is the Weltzeituhr. This clock was built in 1969 and shows the times in 148 cities in the world. The massive clock weighs over 16 tons and is about 10 meters high. The attraction fits perfect to Alex and his function as a central meeting point: No need for discussion about the correct time when one of your friends arrives late. 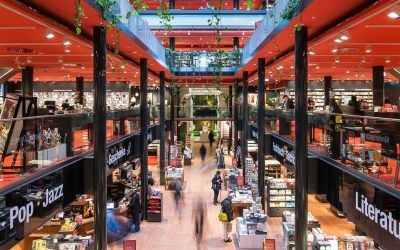 Berlin has a lot to offer when it comes to history and interesting sights, but most tourists also love to spend some time shopping. 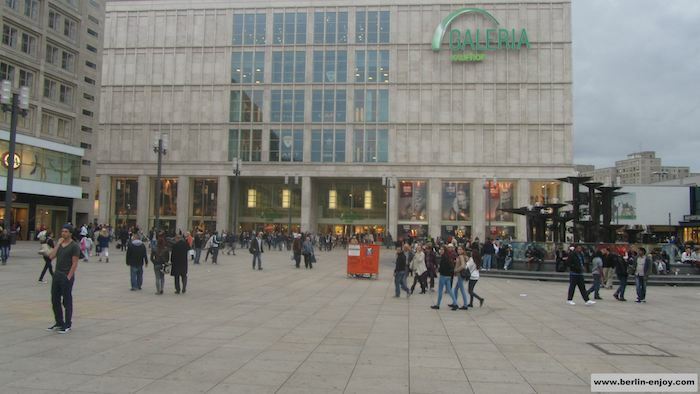 Especially the large department stores are great and on Alexanderplatz you can find one of them: Galeria Kaufhof. Almost anything you might need can be bought on one of the five floors of this large department store. Besides Galeria Kaufhof there are some other large shops at Alex (Saturn, Esprit, Primark) but for the real shopping experience you should walk about 500 meter to the shopping-center Alexa. As mentioned before, the central location of Alexanderplatz makes it a great spot to meet up with friends or relatives. You can visit a casino underneath the Fernsehturm, there is a cinema directly at the square and you can also play some bowling on walking distance. Besides that there are plenty of bars, restaurants and pubs around. For the daredevils it is even possible to jump off one of the Parkinn Hotel. During the months November and December there is another reason to visit Alex, there are some pleasant Christmas Markets on the square then. 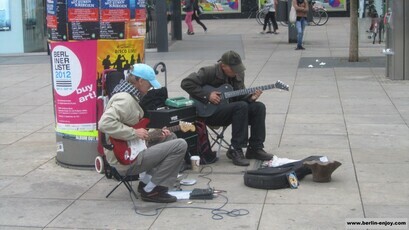 All in all we can conlude that Alexanderplatz has a lot to offer. 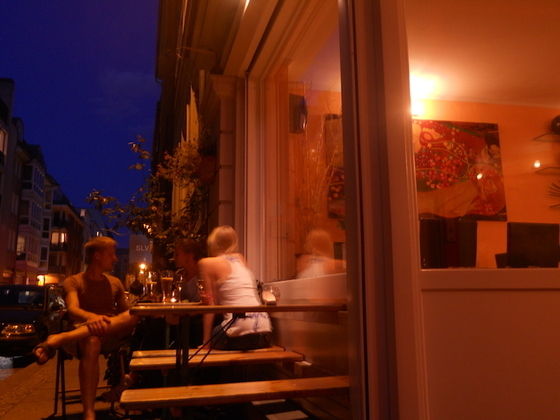 It is a very touristic spot and therefore it is also quite busy most of the time. But still I would suggest that you visit this famous square atleast once in your life. This is an awesome post..!!! Loved it and keep sharing. Btw I am planning to go to Berlin in coming winter. Is there any place which is famous to visit in winter? Hi Job, is Alexanderplatz central to the Brandenburg Gate and any other historical attractions. I am hoping to come to Berlin for the first time in August and would like to see the sights and have been advised to stay in Alexanderplatz. Is this correct and if not, could you recommend a district where I would be central to them. Thanks. it is indeed a great starting point to walk to the Tv-Tower and the Berliner Dom. The Brandenburg Gate is a bit further but you can still walk it. You are very welcome Marj. Enjoy your time in Berlin. That was a cool post. I will be there this whole coming week with my father. Thank you for the information! thanks for your comment and enjoy the time in Berlin with your father!